Well Done to Our Future Champions! The first rule of our Kids Fight Club – it’s all about learning and control! Last Sunday we had our first Kids Fight Club of the year, a chance for our youngest members to show case their skills in front of their parents and put them to the test in the ring against a fellow class mate. The kids Fight Club is a sparring competition with no head contact, full protective equipment and designed to help our kids perform all their martial art techniques under a little extra pressure with a team in the corner, a referee and an audience made up of their parents and other gym members. With a dedicated kids competition team (who travel the country to fight and have even traveled abroad) the Fight Club is a competition atmosphere but without any pressure. It’s a simulated competition to get our members used to the environment. Some will go onto compete and others just do it for fun which is (ultimately) what it’s all about. Plus it’s a great way to help children grow in confidence amd help their self-esteem improve. Enjoying your training and enjoying the opportunity to test out your techniques for real. We run kids fight clubs throughout the year (and we run adult one too). They’ve proven to be an effective method and stepping stone in helping our Muay Thai members move from training in the gym to fighting in the ring around the country. And we’ve seen many of our youngest members grow up, move into our teen class and onto the adult Muay Thai class – join our Lumpini Fight Team and win World Titles around the world. To find out more about our kids martial arts classes call us on 01293 552 511 or visit our gym in Manor Royal, Crawley! 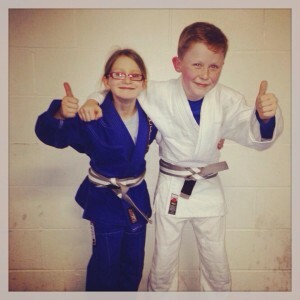 A massive well done done to Lily and Drai on their graduation from White to Grey/White belts in Brazilian Jiu Jitsu. The grading syllabus is internationally recognised by the International Brazilian Jiu Jitsu Federation (IBJJF) the same organization that sanctions many of the top competitions around the world. 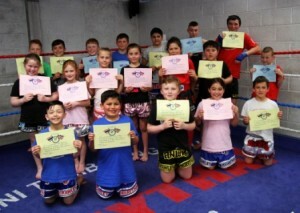 Which mean their grading will mean something at every Brazilian Jiu Jitsu club in the UK and abroad. The grading combined a demonstration of techniques with sparring against live opponents with the 11 year old students grading for a hour, as well as demonstrating plenty of maturity to their older class mates. The next kids BJJ grading will take place in approximately 6 months. An unusual martial art, Brazilian Jiu Jitsu places great pride on its grading structure. 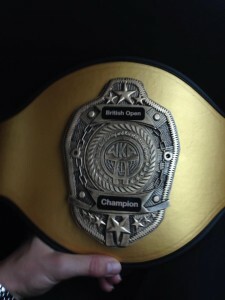 Only adults are allowed to earn the coveted Black Belt which typically takes up to 10 years to earn. The kids grading works through grey, yellow, orange and green belts before they move onto the adults grading syllabus as a Blue Belt. Again, to preserve the quality of the art and the belt the youngest age for a Blue Belt holder is 16 years of age. To find out more about our Kids BJJ classes Crawley call us on 01293 552 511 or you can read more about the ‘Gentle Art’ here. Our new website dedicated to personal fitness, circuit training and Kombat Fitness classes. We teach all of our classes at the Crawley Martial Arts Academy in Manor Royal, Crawley, West Sussex. Established in 1996, we’ve been helping people get fit and teaching martial arts for a long time and helped a lot of people over the years. What’s become — clear as day — is that there are hundreds of people looking to get fit but totally turned off by the gym and hate the thought of endless hours of boring, unsocial, unfriendly cardio training. Over the years we’ve discovered that while our members love learning a martial art, something practical for self-defence, interesting and rewarding… what they’re really motivated by is the amazing results they get. Intense cardio-training that melts fat and gets the men and women who train here, lean and toned. If you’re bored of the gym, going no where on the treadmill and looking for a fun and social way to get in the best shape of your life. Give us a call 01293 552 511 and we’ll tell you everything you need to know to get started.